Thermoweldable belts can be welded in our workshop or delivered open for welding on site. 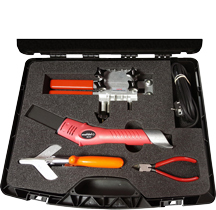 The standard tool kit is offered in a case with joint trimming accessories. End-to-end welding is suitable for all polyurethane or polyester belts (reinforced or unreinforced). Unreinforced belts with end-to-end welding retain uniform strength over the joint. Reinforced belts are welded end-to-end without the need to remove the reinforcement at the joint. Because of this, all disadvantages related to normal drilling are eliminated. 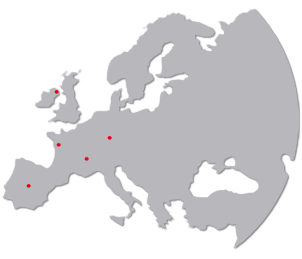 Our special reinforcement cannot be melted at normal welding temperatures (260°C) and therefore, there is no risk of contaminating the weld provided a Mafdel iron with a thermostat is used. For best results with reinforced belts, we would, however, advise our overlap joint using the specially developed overlap tool. This Overlap tool kit is offered in a case with cutting and joint trimming accessories. 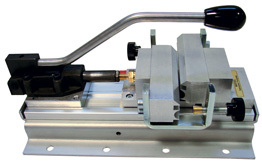 We also offer a tool case with a lever clamp and an iron with electronic temperature regulation. The clamp allows you apply greater pressure thanks to the lever action, and also offers faster joining cycles. The iron offers quicker heating and welding times. All Mafdel profiled belts can be overlap welded: round, cogged or plain trapezoidals, with covers, with top-ridges and particularly reinforced belts. Tubular round belts are ideal for applications requiring frequent assembly/disassembly, or in cases of frequent repair. Joining using plugs does not require special tools. All Mafdel tubular round belts are thermoweldable and can be welded with the regular Mafdel tools if required.